Larimar, the Caribbean beauty, is a fabulous colour with characteristic cloud patterning. 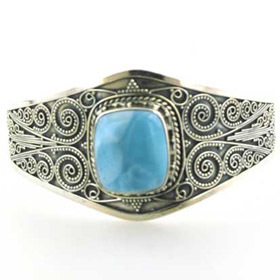 These gorgeous larimar bangle bracelets show the gemstone off to perfection. See our larimar pendants and larimar earrings for a coordinating piece.